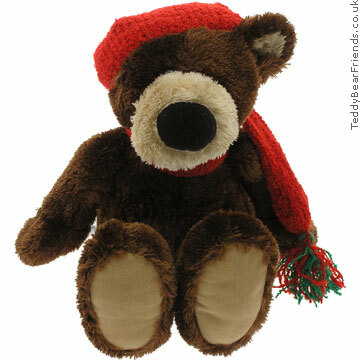 Get this brilliant bear in the Christmas post and you'll be merry all during the festive season. Tinkerton sings the popular Christmas song Jingle Bells—his mouth opens and closes and his head bops up and down, while his big chunky feet come together in time to the famous xmas tune. This plush bear is the most fantastic present to give a child or share his singing with all the family during the winter holidays. Gund are one of the world's foremost teddy bear manufacturers and always bring out a great range of Christmas teddy bears and gifts that will be loved and will last. This cute bear has a child's voice and at the end of the song, calls out Merry Christmas. All you'll want for Christmas is him!